Jack Weaver darts past the Centerburg defense in Highland’s 36-6 win over the Trojans. While the Highland offense didn’t get off to a fast start against Centerburg Friday night, the defense had no such troubles, stifling the Trojans in what would wind up a 36-6 win by the Scots. Highland’s first possession was a three-and-out and their second ended on its fourth play when the team fumbled the ball away. However, they wouldn’t give up anything to the Trojans in that time. On Centerburg’s third possession of the game, the Scot defense was dominant, getting back-to-back impressive stops. Starting with the ball on their own 46 after recovering that fumble, the Trojans were victimized by a holding call and back-to-back sacks of quarterback John Sheasby, all of which moved the ball back to the 19 for a fourth-and-37. Centerburg’s punt was blocked, but the refs determined that Highland had obtained possession of the loose ball and fumbled it, giving it back to the Trojans on their own 22. The Scot defense remained strong, though, driving the Trojans back four yards over the next three plays to force another punt. This time, they got the ball on their own 42. After a six-yard run by Brody Matthews, Brock Veley took the ball 52 yards for a score on the final play of the opening period. Matthews added a two-point run and it was 8-0 going into the second frame. A big run by Stephen Schmitt moved Centerburg into scoring position, but Highland’s defense forced them to turn it over on downs. 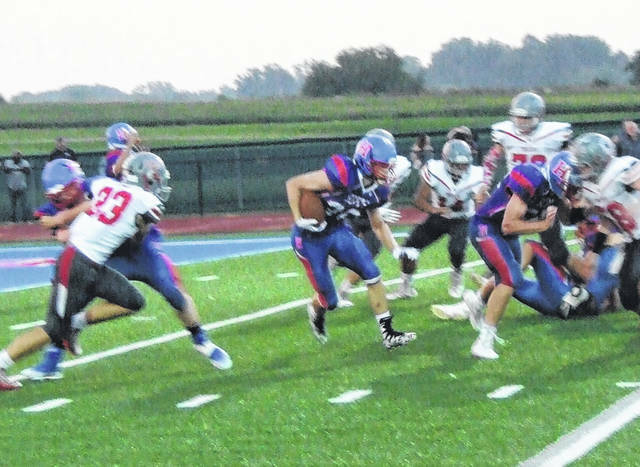 Starting from their eight-yard line, the Scots ran it eight times to move the ball near midfield, setting up a 51-yard scoring dash by Tate Tobin. Quarterback Ian Taylor then converted a two-point pass to make it 16-0 midway through the second. The Scots forced a quick three-and-out, but were victimized by another fumble to give Centerburg the ball on their 26. Schmitt immediately ran for 18 yards and three plays later, Sheasby scored on a five-yard run to make it 16-6. Highland bounced back from that setback to score on a seven-play drive with Tobin taking the honors with a one-yard run. Taylor scored himself on the team’s two-point try to make it 24-6. Right afterwards, lightning was seen by an official, necessitating a 30-minute weather delay. With the delay happening so close to the half, when that time was up, it was decided to move straight onto the third quarter after the second ended. Highland, who got the ball to open the third, immediately got back on the scoreboard with a seven-play drive sparked by a 23-yard run by Veley and ended with a nine-yard touchdown by Matthews to boost the Scot lead to a 30-6 margin. The home team then forced another three-and-out and then effectively ended the game with a 15-play drive that took over six minutes off the class and ended with a three-yard Tobin run for six more points. With a 30-point lead, the rest of the game was played under running clock rules with both teams primarily playing young players. After the win, Carpenter was happy, noting that his squad had been dealing with some illnesses, which had an effect on the the team’s practices over the week.